Every one of us is taught that there are five stages of grief. I know I was. Denial to anger to depression to bargaining until you finally reach “the goal” of grief, which is acceptance. Maybe it is because my situation is unique or maybe because I am just wired differently than the rest of the world… To me, this doesn’t fit me. Don’t get me wrong, the five different stages are all ones that I have felt, so those themselves are all very valid. But to call it a “stage” is so misleading. It is as if grief is supposed to be this staircase that with each step or “stage” you finally reach the top of the stairs where you find “acceptance.” It is almost as if once you pass a stage, you graduate from that feeling and move one step closer to the trophy of acceptance. Once you reach acceptance, fireworks go off and bands start playing music, and then you get to continue your life with fun, freedom, and the weight of the world lifted off your shoulders and no more sadness in your heart! To me, grief is more like that hand game we used to play when we were kids. You and your friends all put your hands on top of the others, and then you constantly race to get your hands on top. Of course, very quickly, someone else puts their hands on top of yours. And it just goes on and on. That’s how my grief feels. Instead of hands piled on top of each other, it is these stages of grief. Constantly shifting for the top position. Lately, depression and anger have been winning out on that top spot, but it is a continuous emotional change. For me, there is no ‘step’ to graduate from. I can go from the “goal” of acceptance and having a good time with friends to being at depression just hours later. “Time heals.” That is another phrase that I hear oh-so-often when talking about the loss of a child. Time does not heal. That is a misnomer. What “time” does is give us the space we need to readjust our lives after our loss into something that is more doable on a day-to-day basis. “Time” gives us a chance to explore our feelings, to feel the various parts of grief, and to learn how to manage how to live with this grief. You can’t package grief in a nice and pretty little formula. There is no rhyme or reason to understanding grief. There is no time frame that you can put on grief. I know in society today that we like things to be easy and understood so that people around us can “understand” what we are going through. But the grief from the death of your child, especially the child that you fought for so long and that passed away in your arms after a long fight, is not something that others will ever understand. Grief is a jumbled, chaotic part of my life now. It is not any easier today than it was last month. In fact, it is actually getting harder the longer I live without my little girl. As more time goes by, the more I yearn for that one more opportunity to just hold her in my arms and see her smile. But as “time” continues, I’m relearning how to live my life without her. Moving through life on this alternate path that I did not want to take but I am forced to take. My kids, my husband, and I are all relearning how to live our lives together without her. By recognizing grief isn’t in stages but is more like hands on top of each other constantly fighting for top position, it takes away a lot of the pressure to conform to what people think on how I should be grieving. Some people who think I’m “doing so well” after losing Hannah don’t see the tears and depression when I am alone in my thoughts. 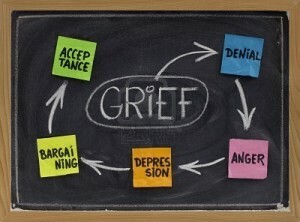 The really need to disband that fallacy of grief being in stages. Grief, especially with losing a child after a long illness, does not come in stages. We don’t graduate from one stage and go to the next. It puts too much pressure on us to feel that we need to get through a stage in order to start healing our hearts. I accept that grief will always be a part of my life. I loved Hannah so much that I just have to accept that. Thank you so much for this post. I am not in the same place you are, but I feel like the last few months are a jumbled mess of grieving. I try so hard not to do it now and just enjoy the precious child in front of me. But they just keep creeping in. Most of the time I try to live in denial, but I feel like all I do is sit in the depression stage. I wish I could find the words to take away the pain, but that pain is because you love and care for Hannah. She is a part of you and always will be. If it helps, you really do sound normal. “One day at a time” is right. Tomorrow you may be feeling completely different things. Carrie, My dad died when I was 11. I am nearly 59, and I can tell you that for me grief is an unending part of my life. I’ve been through the stages, but as I have gotten older, I wish he was with us so I could ask him questions about his life. Things I’ll never know. As above one step at a time, one day at a time, till your mission in life is complete. It make take a lifetime, but you will have accomplished what you set out to do. I have heard many metaphors for grief, but never the hands game metaphor. But it makes such sense to me…the frenetic way in which feelings change. Thank you for sharing this thought. I’m so sorry to hear about Hannah. I will always remember your beautiful family.